I love experimental cooking. That’s why this recipe makes me so happy. It is nearly impossible to mess up. Plus, there are tons of variations you can use to make it your own. For me, adding in cayenne pepper helps find the contrast between the sweet and spicy flavors. It is a glorious combination. But if staying sweet is your thing, adding in cinnamon and nutmeg is so warm and comforting. 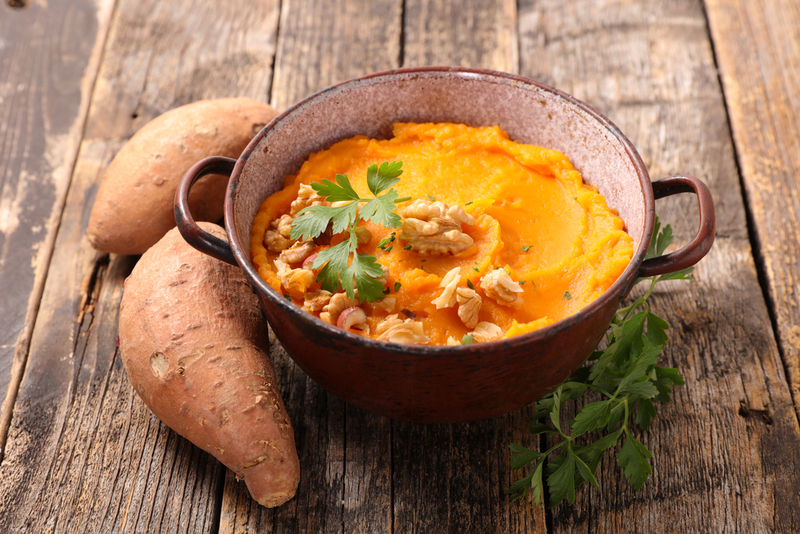 Plus, sweet potatoes are full of beta-carotene, which gives sweet potatoes their orange coloring and makes them so good for your eyes and skin! Once cooled, (but still warm) carefully peel sweet potatoes and place in large mixing bowl. Peelings should fall off of potato easily, but be careful as they can trap heat and be deceivingly hot. Whitney Rose is a Health Promotion Specialist at Blue Cross and Blue Shield of North Carolina. She graduated with her Master’s and Bachelor’s of Nutrition Science and is a Certified Health Coach. Her number one focus in life is to make a positive impact on those she serves through helping others improve their health and live their best life. She is an avid football fan, closet CrossFitter, definite dog lover.